What do Kashmiri stone pelters mean when they shout 'Azaadi'? What do the Kashmiris want? What are the factors destablising the Kashmir valley? What are the solutions? Did the September 28, 2016 surgical strikes serve their purpose? Is peace possible in Kashmir? As Northern Army Commander, Lieutenant General K T Parnaik was the man in charge of defending the Line of Control, supervising the security and anti-terrorist operations in Jammu and Kashmir and guarding the China border. How do you assess the situation in the Kashmir valley today? There are 4, 5 influencing factors that are destablising the valley. If we segregate them and handle them individually, then collectively we can bring the situation under control. After three years in office, Indian Prime Minister Narendra Modi has centralized power enough to give his Bharatiya Janata Party (BJP) the leeway to pursue long-awaited reforms. Modi's administration achieved a victory on that front in the first quarter, when Parliament passed the Goods and Services Tax bill. But the task of introducing the changes prescribed in the law still lies ahead of the prime minister and ruling party. While India will likely manage to implement, at least in part, the sweeping tax reform by the government's July 1 deadline, lingering disagreements between state leaders and their national counterparts in New Delhi over tax classification will frustrate progress. In fact, the states of West Bengal and Tamil Nadu, two of the strongest objectors to the tax scheme, resisted adopting local versions of the legislation until recently. Their success putting the laws into practice will serve as a test case for the overall efficacy of the measures in India. In addition, complications bringing the businesses in India's vast informal economy into compliance with the laws, as well as obstacles to getting the plan's information technology infrastructure system up and running, will hold up the implementation process. In part because of the fitful progress of the tax reform, India's business climate is unlikely to improve in the third quarter as the central government hoped it would. India's $2 trillion economy will keep struggling to attract foreign investment into its manufacturing sector, the focus of Modi's "Make in India" initiative. Of course, in a democracy of nearly 1.3 billion people, change is a gradual process, and the tax reform package, even if only partially implemented, marks a landmark achievement for India. The measures' implementation marks the first of many steps toward unifying the country's fragmented economy, boosting interstate trade, streamlining supply chains and increasing gross domestic product growth. I’m normally leery of the pervasive threat inflation that tends to dominate discussions of foreign policy. Because the United States is so strong and in such a favorable geopolitical location, pundits and policymakers have to pretend the sky is falling to justify bigger military budgets and convince the public to keep meddling in distant lands. And whether the threat is falling dominos, “creeping Sharia,” the “axis of evil,” or even “violent extremism,” the actual threat these faraway dangers pose is usually exaggerated. Right now, however, we’re at a moment when I think genuine concern is warranted. This is not to say that we’re on the brink of a major war, let alone a global clash of great powers. But flammable material is accumulating and it is hard to have high confidence in the political leadership in several key countries (including here in the United States). We would all do well to take stock of the global order: Is the world more secure than it was a year ago? Specifically, is the risk of war increasing or decreasing? Is the danger of a serious economic crisis higher or lower? Are the institutional arrangements and norms that help smooth and resolve conflicts of interest and enhance the prospects for international cooperation more or less robust than they were in June 2016? ** Could the Army's WIN-T Inc. 2 Survive a Russian or Chinese Electronic Warfare Attack? Critics of the network are raising questions as to its ability to perform necessary combat functions amid jamming, electromagnetic interference and cyberattacks from a technologically advanced enemy. An Army analysis of battlefield networks will likely closely assess the extent to which its flagship combat Satcom and radio network can be “hardened” and made more resilient against the kinds of electronic warfare and cyberattacks likely to occur in a major-power, near-peer type mechanized war. The Army’s mobile Satcom and high-bandwidth communications network, Warfighter Information Network Inc. 2, has been fielded to at least 16 Brigade Combat Teams and has performed well in combat during ongoing ground wars. Unlike WIN-T Inc. 1 which transmits combat relevant information between “fixed” command centers, the Inc. 2 network utilizes vehicle-mounted “High-bandwidth Networking Radio” and satellite-dish connectivity to enable mission-command on-the-move; with WIN-T Inc. 2, commanders moving through warfare in combat vehicles can view and share moving digital maps, battle-relevant intelligence information and fast-changing force-location information. Henry Kissinger’s speech today at the Margaret Thatcher Conference on Security was framed as a tribute to Thatcher. In fact, it was a conversation with her. Speaking to the conference – organised by the Centre for Policy Studies, CapX’s parent body – Kissinger shared a few memories of the former Prime Minister. Her lecturing him about how politics was about moving the centre, not moving towards it – while still a little-known education minister. Her splenetic response when he asked her which of the compromises suggested by the Foreign Office over the Falklands she favoured. Almost as soon as he was elected, India’s “reformer-in-chief” sought to upend the inefficiency and corruption endemic to the country’s lackadaisical bureaucracy. Citing bureaucrats’ struggle to get in their usual round of golf, The Washington Post’s Annie Gowen wrote, “Babudom is now in peril”. Three years later, it seems the reports of Indian bureaucracy’s demise were greatly exaggerated. While there is no denying that the Narendra Modi government has attempted to hold the babus accountable, these efforts have been misplaced. By targeting non-performing individuals in an archaic and defective system, Modi hopes to leverage his man-management skills to enable him to deliver on his campaign pledge of “minimum government, maximum governance”. Such an approach, however, only offers stop-gap solutions while systemic governance issues are allowed to persist. Nowhere is this more apparent than in “Digital India”, the government’s flagship initiative seeking to create an interface between the government and people. Though the initiative is often cited for its potential to realize the aspirations of 1.2 billion (and counting) Indians by bringing them into the 21st century, it betrays the lack of a sustained strategy and vision, particularly with respect to governance. President Trump has decided to allow the Pentagon to send in more American troops to reinforce the Afghan security forces which are faltering in the face of this year’s annual spring/summer offensive by the Taliban. This is a welcome change for the military which chafed under President Obama’s arbitrary timelines for the “Afghanization” of the war. It is easy to blame Obama for the sorry performance of the Afghan National Army (ANA) since 2012, but the military and Pentagon planners need to ask themselves some hard questions. The Pentagon has tried to build a competent ANA for nearly two decades now under two (now three) presidents; the results have been sub optimal at best. In planning its mini-surge the Pentagon planners need to ask themselves not what they did wrong, but what they didn’t do right. In my view, the primary answer is logistics. Combat arms officers (and I was one of them) have a tendency to roll their eyes when logisticians begin to pontificate, but I have spent enough time observing the ANA to be convinced that a better air supply chain is the answer to many of its problems. To understand the problem, we need to understand the nature of the war. Afghans on both sides of the conflict know how to fight. Their natural instincts may run counter to western norms, but given proper support, they will fight effectively. The primary difference between the two sides in this conflict is that the Taliban are largely fighting on home ground and are able to use interior lines of communications (LOCs) for logistics. The ANA was built on western lines; it requires longer LOCs and most of its troops are fighting far from home. We have not adequately addressed those challenges. This study examines the role of an “enabling environment”, an atmosphere of good governance and effective public financial management (PFM), in mobilising resources needed for the implementation of the ambitious 2030 Agenda for Sustainable Development. Achievement of the 17 Sustainable Development Goals (SDGs) requires substantial financial resources, and generation of those resources is largely contingent on the presence of an enabling institutional and policy environment. If an environment of good governance with effective PFM institutions can be ensured, the domestic and external resources necessary for the achievement of the SDGs can be mobilised. In environments where PFM systems are ineffective, corruption is rampant, and transparency and accountability are minimal, it is unlikely that sufficient resources for sustainable development will be mobilised. There are four principal financing sources: domestic, international, public and private. While the sources have grown in recent years, they are still markedly less than adequate for successful implementation of the 2030 Agenda. This paper first assesses the centrality of enabling environments for sustainable development at the global level, then applies the framework to a Pakistan case study. The operationalisation and implementation of the 2030 Agenda is examined at the country level by analysing the implications of an enabling environment, or lack thereof, for domestic resource mobilisation (DRM) and for attracting foreign financing in the form of development cooperation and foreign direct investment (FDI). In view of the overall strong link between an enabling environment and its potential for resource mobilisation in developing countries, including Pakistan, there is a need for consistent locally-driven efforts and strong political will to improve the quality of governance and create an environment that is conducive to resource generation for the successful implementation of the 2030 Agenda. In the midst of Trump administration developing its policies on Afghanistan and Pakistan, the experts in Washington, are divided. The key question seems to be how to make Pakistan cease its support to the Haqqani Network and other militant groups that are destabilizing the region, especially Afghanistan. Moeed Yusuf and Stephen Hadley wrote an op-ed published by The New York Times offering some insights on the subject. In War on the Rocks, Christine Fair responded critically. Having myself been involved in Pakistan’s foreign and security policy both, as a state employee in a senior advisory role and a scholar, it seems to me the two articles misconceive not only Pakistan’s threat perceptions but also the ability of the United States to influence Pakistan’s behavior. Hence, the two articles offer the same old tried, tested, and failed approaches to handling Pakistan. ‘Indispensable’ Palau Deal At Risk; Will China Get Access? “Palau is indispensable to our national security and funding the compact is key to our strategic presence in the region.” That’s what the Defense Department’s 2018 budget request says — but the House Armed Services Committee disagrees, defunding a $123.9 million payment that gains us access to the islands. Why is Palau indispensable? Look at the map. That will help. It commands approaches to the Philippines and to Indonesia, as well as Papua New Guinea. And, of course, they flank the Marshall Islands, as well as a wide range of Pacific islands flanking our ally Australia. Also, one source notes that the importance of Palau airfields have taken on “increased importance for PACOM/PACAF given Duterte and his rhetoric in the Philippines.” It provides “a more guaranteed form of access to airfields in the second island chain,” this source says. The Qatar crisis flared up when the official Qatar News Agency quoted Sheikh Tamim, the Emir of Qatar, as saying that “there is no wisdom in harbouring hostility towards Iran”. These words not only effectively supported Iran, but criticised the US and Saudi Arabia’s policies towards it. Qatari officials quickly announced that the news agency had been hacked, and the report was “fake news” – but it was too late. For Saudi Arabia, which views Iran as its main rival and is taking every opportunity to isolate it, these words were intolerable. It promptly corralled its allies in the Middle East (notably the UAE, Egypt and Bahrain) to collectively cut off their relationships with Qatar and impose a series of sanctions. These, Riyadh said, would be lifted if Qatar agreed to a list of 13 “non-negotiable” demands, including cutting diplomatic ties with Iran, shutting down the al-Jazeera news network, and ending “interference in sovereign countries’ internal affairs”. In doing so, Saudi Arabia took a gamble. Qatar has two options: accept Saudi Arabia as a “big brother” and comply with its diktats, as most of the Gulf states do, or continue with an ambitious and relatively independent foreign policy and further incur the Saudis’ wrath. As the fight against the Islamic State moves beyond its de facto capital in Raqqa, the Pentagon is readying itself for an increasingly complex battlefield in northern Syria, where U.S.-backed forces, pro-Syrian government troops and Russian jets will likely all be fighting near one another. Speaking to reporters on his way to Germany Monday to meet with European allies, Secretary of Defense Jim Mattis spoke broadly about the U.S. military’s future operations against the Islamic State in the Euphrates River Valley, adding that it will take “more precision” to stave off any incidents between the disparate forces operating there. Mattis also acknowledged that the U.S. would continue to supply Kurdish forces in the north with weapons despite objections by U.S. ally Turkey. “When they don’t need them anymore we’ll replace them with what they do need,” he said. If you’re a Europe-based think tanker, policy wonk, or commentator, Donald Trump and Brexit are great for business. Just about every Brussels pundit is leading off his musings about Europe’s future with some sort of Trump or Brexithook. If you haven’t heard by now that either Trump, Brexit, or — ideally — both offer historical windows of opportunity for European defense cooperation, you’re way outside of the Brussels bubble. Those invested in the notion that the European Union can become strategically autonomous interpret pretty much whatever happens out there as a catalyst for greater European defense cooperation. Every time there is some sort of global crisis or “external shock,” catalyst-related narratives pop up — there are just too many politicians, officials, and pundits in Europe who lust after such narratives. As the Pentagon writes a long-term drone plan, the former head of Air Force intelligence has some suggestions. The U.S. military needs to overhaul the way it buys and manages its larger drones, according to a new report from a retired general who used to oversee Air Force intelligence. The push comes as the Pentagon puts the finishing touches on a new roadmap for unmanned systems, a plan that is expected to guide the military for the next 25 years. “We have to treat the remotely piloted aircraft enterprise in a much, much more efficient and effective fashion than we have in the past,” said David Deptula, a retired lieutenant general who is now the dean of the Air Force Association’s Mitchell Institute think tank. Deptula — who retired in 2010 as the Air Force deputy chief of staff for intelligence, surveillance and reconnaissance — is also pushing to put one office in charge of all of the military’s drones that fly at medium and high altitudes with manned aircraft. In uniform and since his retirement Deptula has has pushed for Pentagon leaders and Congress to name the Air Force the executive agent for unmanned aircraft. Based on the principle that transformative world events are not random, but are in fact predictable, Stratfor develops decade, annual and quarterly forecasts. These forecast are built upon Stratfor’s geopolitical methodology, our framework for identifying and forecasting the fundamental trends shaping the international system. Below are the global trends highlighted in Stratfor’s forecast for the third-quarter of 2017. The complete forecast is available at Stratfor Worldview. The U.S. Exits Stage Left? When world leaders gather in Germany for the approaching G-20 summit, they will no doubt make a slew of assertions — some alarmist, others justified — about a U.S. retreat from the global stage. Talk of leaders like German Chancellor Angela Merkel, French President Emmanuel Macron and Chinese President Xi Jinping stepping in to fill the void and uphold global governance on major issues such as free trade, climate change and security can be expected. But there is an underlying reality to that narrative that should be kept in mind. For half a millennium, Russian foreign policy has been characterized by soaring ambitions that have exceeded the country’s capabilities. Beginning with the reign of Ivan the Terrible in the sixteenth century, Russia managed to expand at an average rate of 50 square miles per day for hundreds of years, eventually covering one-sixth of the earth’s landmass. By 1900, it was the world’s fourth- or fifth-largest industrial power and the largest agricultural producer in Europe. But its per capita GDP reached only 20 percent of the United Kingdom’s and 40 percent of Germany’s. Imperial Russia’s average life span at birth was just 30 years—higher than British India’s (23) but the same as Qing China’s and far below the United Kingdom’s (52), Japan’s (51), and Germany’s (49). Russian literacy in the early twentieth century remained below 33 percent—lower than that of Great Britain in the eighteenth century. These comparisons were all well known by the Russian political establishment, because its members traveled to Europe frequently and measured their country against the world’s leaders (something that is true today, as well). The quick infection of nearly 300,000 computers worldwide is reportedly due to two software exploits released in April by the hacking group called the Shadow Brokers. A sweeping set of cyber attacks hit critical services in Ukraine this morning, and have so far shown no signs of slowing down. The attacks appear to be related to a new strain of the ransomware known as Petya, which Costin Raiu, director of global research and analysis at Kaspersky Lab, says is already spreading worldwide. In the space of hours, Ukraine’s government, top energy companies, private and state banks, main airport, and Kyiv’s metro system all reported hits on their systems. The attacker was not immediately clear—Wired, in a recent story, described Russia as using its neighbor as a “test lab for cyber war,” but Moscow denies any part in past attacks. Its own state oil giant Rosneft also reported being hit by a cyberattack today; Rosneft’s website was unresponsive at time of writing. It’s unclear if the attacks are linked. Another Russian oil firm, Bashneft, has been hit too. WASHINGTON – Today, Rep. Michael Turner (R-OH), Chairman of the House Armed Services Subcommittee on Tactical Air and Land Forces, made the following remarks, as prepared for delivery, on the Subcommittee’s markup. To view the mark and to watch the markup live click here. “The Subcommittee meets today to markup H.R. 2810, the National Defense Authorization Act for Fiscal Year 2018. I want to thank the Ranking Member and all of the members of the subcommittee for their attendance and participation in the overall process this year. I’d like to express my sincere appreciation to Ms. Tsongas, as well as to her staff, for their support and cooperation in putting this mark together. Subcommittee Members have been actively engaged on the important issues facing the subcommittee in a bipartisan manner. This mark addresses the priorities of the Members on both sides. Throughout this year’s NDAA process the committee has repeatedly heard that the total force is strained as the Services continue to do more with less. We heard testimony from the service chiefs about lacking the capability and capacity they need to address current and future threats and the increased risk incurred meeting mission requirements. During subcommittee hearings we heard how air and land forces continue to face significant challenges in rebuilding full spectrum readiness from years of deferred modernization funding. On Christmas Day in 1914, three former cross-channel packet ships, the Engadine, Empress, and Riviera, stood off the island of Heligoland in the North Sea. Under the watchful eye of the Royal Navy cruisers Arethusa and Undaunted, the three ships pulled back the tarps erected on their sterns and forecastles to reveal nine seaplanes. The aircraft – three Short Folders (Short was the company name; Folder was the model and denoted the aircraft’s ability to fold its wings for storage), four Short 74s, and two Short 135s – were assembled and carefully lowered into the water. The Folders had a 67-foot wingspan, were powered by a 160-horsepower engine, and weighed 3,040 pounds fully loaded. The other two models were derivatives of the original Folder and had similar, if not exact, characteristics. Seven of the nine aircraft were able to get airborne (the other two were unable to break the dynamic tension of the water) and headed eastward carrying three 20-pound Hale bombs apiece, each of which contained 4.5 pounds of explosives within 13 pounds of steel guided by aluminum tail fins. Combined, the 21 bombs had less destructive power than one 13-inch shell fired from a British battleship, but these weapons could be taken directly to their targets and dropped precisely on top of them. As U.S. Cyber Command continues to mature its workforce, operations and tactics, so too are allied nations, some of which are also standing up cyber commands. Just as the U.S. enjoys information sharing, intelligence sharing and cooperative battlefield integration with friendly international forces, the it is seeking to do the same in cyberspace. CYBERCOM is currently working on a concept of operations draft about defensive cyber ops with the Five Eyes nations, which includes the U.K., Canada, Australia and New Zealand. Brig. Gen. Maria Barrett, deputy of operations J-3 at CYBERCOM, at a June keynote address hosted by AFCEA’s Northern Virginia Chapter announced the development of the draft. “This included a tabletop exercise with the participants to better understand the friction point when it came to how we might operate in defensive operations together,” she said. Beginning with the Five Eyes partners made sense given the robust intelligence sharing information the already exists, Lt. Cmdr. Brian Evans, lead strategist and defensive cyber operations planner in the Defense Department Information Network Operations and Defensive Planning Division at CYBERCOM, told C4ISRNET on the sidelines of the Defensive Cyber Operations Symposium in Baltimore, Maryland, on June 15. 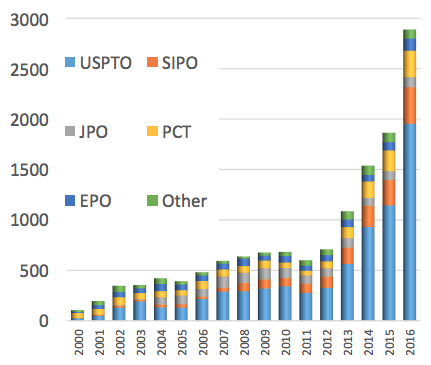 The number of patents granted has rapidly increased. Figure 1 shows the number of artificial intelligence (AI) patents granted by application country and technology type and reveals that it has increased more than threefold (from 708 items in 2012 to 2,888 items in 2016). In particular, AI patents granted in the US increased by 1,628 items during this period (Figure 1a), accounting for approximately 75% of the increase worldwide. Businesses and government agencies have been hit with a variation of the Petya ransomware -- that is, malware that holds crucial files hostage. The malware is demanding $300 in bitcoin before victims can regain access. The new ransomware, identified by security firm Bitdefender as GoldenEye, has two layers of encryption, researchers said. It locks up both your files and your computer's file system. "Just like Petya, it is particularly dangerous because it doesn't only encrypt files, it also encrypts the hard drive as well," said Bogdan Botezatu, a senior threat analyst with Bitdefender. The malware forces an infected PC to reboot as soon as it finishes encrypting files, so you'll see the ransom demands as soon as possible. Researchers at Recorded Future said there's also a hidden Trojan on Petya that steals victims' usernames and passwords. A writer going by the ‘pen name,‘ Wagas posted an article recently on the website, HackRead.com,with the title above. Mr. Wagas writes that hackers are now using the heat/effluents, as a mechanism to insert malware, and/or, hack into mobile devices, and other Internet-connected ‘things.’ Cyber security researcher, Ross Bevington (@FourOctets on Twitter), recently demonstrated how to hack a computer/mobile device at the London B-Sides Conference on cyber security held on June 7, 2017 in London. Mr. Bevington’s technique involved using the heat/effluents from the e-cigarette to “trick” the mobile device or computer into believing that “it” [the e-cigarette], “was a keyboard.” And, Mr. Bevington was also able to “interfere” with the targeted computer/mobile device’s “network traffic,” as well. Hackers are able to successfully utilize this technique, “because most of the e-cigarette’s come with a rechargeable, lithium-ion battery, which can be plugged into a cable, or directly connects to the USB port of a computer,” Wagas wrote. When the financial services industry undertook a cyber attack simulation called Quantum Dawn in 2013, the exercise shined a spotlight on the importance of cyber war games in helping organizations improve incident response. Quantum Dawn is an example of how complex cyber war games can be. But not all cyber attack simulations need be so involved. Even a simple rehearsal can help organizations identify gaps in their incident response processes, key decision makers (and blockers of key decisions), and other issues they need to address to properly prepare for a real-world incident. Simple rehearsals allow even small security teams to benefit from the concept of cyber war games.